Codes, Figures and Keys. This display is dedicated to a story which until recently remained an almost unknown yet key part of 20th-century history: the German Enigma cipher machine. We are launching another new small-scale proposal in the Ephemeris Space. A platform for sharing the historical technological heritage of Telefónica, a valuable trust made up of objects, documents and audiovisual material essential for understanding 20th-century communications technology, which provides information on the social context of the last century. This display is dedicated to the German ‘Enigma’ cipher machine, a story which until recently remained an almost unknown yet key part of 20th-century history, since the documentation relating to the Second World War was not declassified until the mid 1970’s. Quick and supposedly undecipherable, it was at the epicentre of the secret war between the 3rd Reich and the Allies’ team of cryptographers – among whom was Alan Turing – who worked at Bletchley Park, the British Military facility. 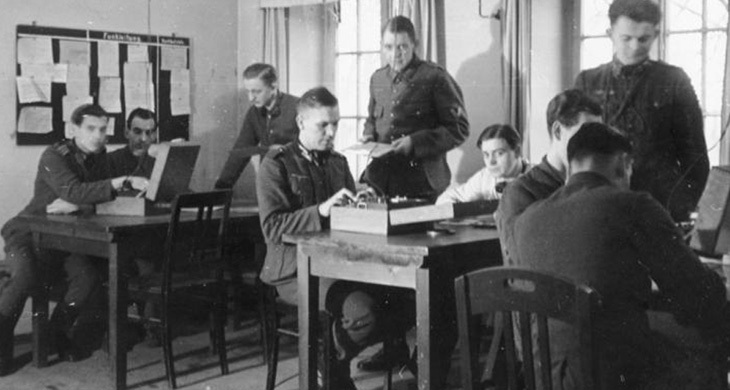 Their objective, to decipher the enigma communication, not only gave the Allies an enormous advantage, but also made a vital contribution to bringing an end to the war. It was calculated that without the achievements of the deciphering team, the war would have lasted another two years. And this is also the story of the men and women (the invisible decoders), the country’s finest minds, who worked for the British intelligence service in this race against time to decipher the coded messages of the 3rd Reich. 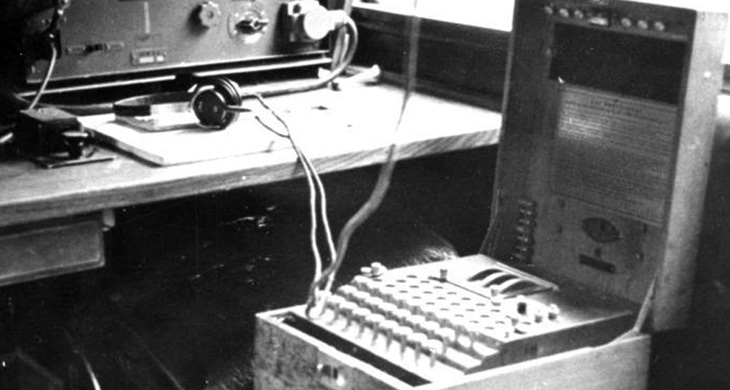 Arthur Scherbius, a German engineer and inventor, built the ‘Enigma’ in the 1920’s, an electromagnetic rotor device for coding messages, with the idea that it would be used for banks and trading firms to keep their communications secret. Initially it did not have any great commercial success, but when Hitler rearmed Germany in the 1930’s, it became, with certain improvements and modifications, the standard cipher machine for the three German armies, who based the security of their radio communications on it, becoming the most advanced of its time. The extreme difficulty in deciphering its code was a nightmare for the Allies’ secret services and it proved to be an enormous military advantage for the 3rd Reich. The German forces depended on these “Enigma” machines to code and decode secret messages transmitted via radio during the Second World War. The Enigma Machine, on the left. Photo courtesy of Helge Fykse, Norway. 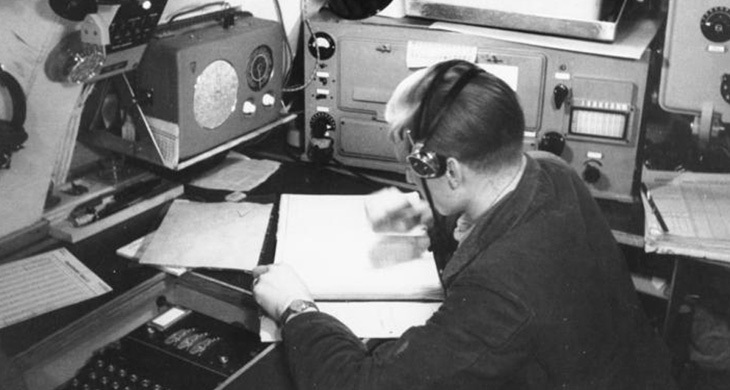 For two Enigma operators to communicate, the two machines had to be configured in exactly the same way. 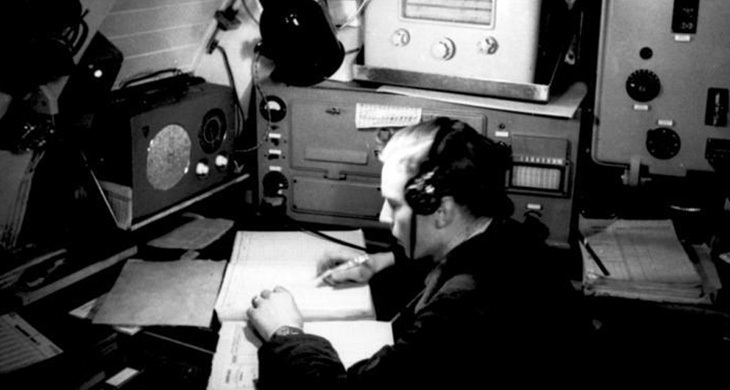 The messages, once coded, were sent via radio using Morse code. Whoever intercepted these messages, only obtained a nonsensical series of letters. However, an Enigma operator with the appropriate keys, when typing in these nonsensical series, would make the letters of the original message light up on a panel of light bulbs and would obtain the decoded message. The configuration of the machine was changed daily, so that even if the code was deciphered one day, the next day it would be necessary to start again from zero. In a mansion north of London, in Bletchley Park, the British intelligence service joined the country’s finest minds in a facility known as “Station X”. Mathematicians, chess players, linguists, engineers… They were recruited to decipher, in a race against time, the codified messages of the 3rd Reich. Up to 10,000 people, distributed over three continuous shifts, worked tirelessly in the strictest secrecy. Although women made up three quarters of the personnel at the famous station, the work that took place there had always been put forward as a fundamentally male business. 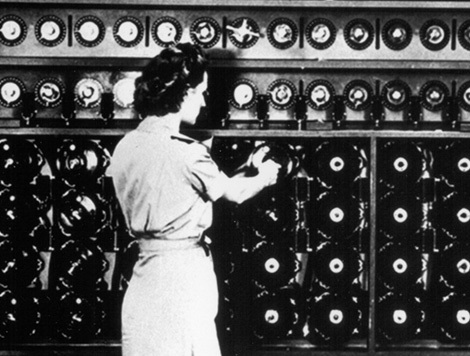 Alan Turing, Douglas Welchman, Dilly Knox… They were decisive in this war in the rearguard for the control of information, but there were other names that only now we are beginning to hear of: Joan Clarke, Mavis Lever, Margaret Rock… Women who formed part of the teams that decoded the Nazi messages. Joan Clarke formed part of Turing’s team, becoming deputy director of cabin 8. Her work was decisive in decoding the messages of the German navy. Mavis Lever and Margaret Rock formed part of the team led by “Dilly” Knox, which would crack the code of the German Intelligence Service, one of the most complicated. The first decoded message was read in 1941. Discovering this code gave the Allies an enormous advantage when organising D-Day. Mathematician and cryptologist, he was a pioneer in the fields of computing and Artificial Intelligence. He is considered one of the founders of modern information technology. At just 23, then at Cambridge, where he graduated with honours in mathematics, Turing published an article that would lead him to be considered the father of computing. In it he theoretically developed a universal computing machine, known as the Turing machine. Then, thanks to a research grant, he received a doctorate at the US university of Princeton. He would end up rejecting a job offer to return to his country, where he was surprised by the outbreak of the Second World War. Alan Turing and Gordon Welchman, Cambridge mathematicians, were already working at Bletchley Park by 1939. One of Turing’s fundamental contributions to the deciphering of the Nazi’s encrypted messages, was a machine that worked on the text of the message and that also discarded the less likely combinations, which considerably shortened the process. When the conflict ended, he went on to work in the National Physical Laboratory, become director of the Computing Department of the University of Manchester, design computers, write the first programming manual in history and the first electronic computer programming system for general use, built at the University of Manchester. He also established the bases for Artificial Intelligence, when, in an article published in 1950, he raised the question “Can machines think?”. For Turing, if a machine behaved intelligently in every aspect, then it must be intelligent. To explain this point, he came up with what today we know as the Turing Test, although initially it was called “The imitation game”: if a human interrogator is not able to distinguish whether a human or a machine is answering their questions, we can understand the machine to be intelligent. 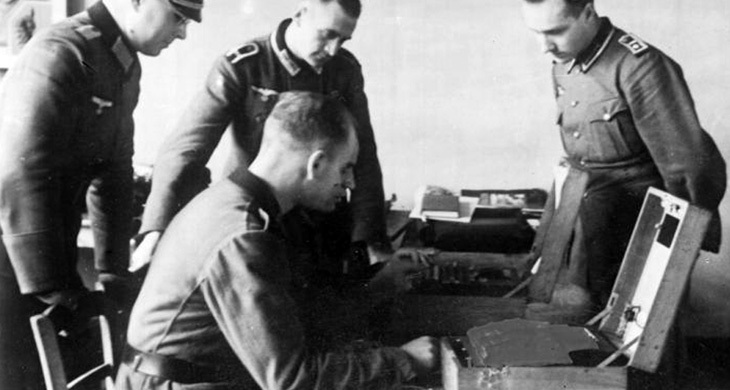 During the Civil War, General Franco purchased several Enigma machines from the German Army. They were not of the more evolved and complex military grade, but were of commercial grade. However within this range, the “K” model was the most advanced and was a reliable and efficient piece of equipment. The man tasked with receiving the machines and training the operators who were going to use them was Member of the Defence Staff and Chief of the Interception and Deciphering Office of General Franco, Commander Antonio Sarmiento, whose name has only been discovered recently. He wrote a report on how to use the machines and explained the necessary settings to correctly decipher messages. In it he outlined the “fabulous figure” of possible combinations that the machine allowed. The Spanish Civil War was the first conflict in which the Enigma was used. The Director of Bletchley Park showed an interest in studying the Spanish machine, as a first step to understanding the German one.